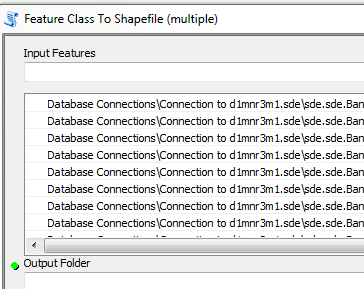 I have many feature classes in a geodatabase and I need to save/export them into shapefiles. Click on every single layer -> export is not a good option, due to the number of feature classes in that geodatabase. you can use the export (multiple). Just right click on the database and choose "export to shapefile (multiple)"
you will see everything in the database in the tool listed (there is a remove button if there are a few you don't want). you see everything in that fds with the same options to add or remove. Just choose the output folder and execute. # The "r" before the '"' allows you to put in normal windows path format (back slashes) by just copying and pasting. inFeatures = arcpy.ListFeatureClasses() """ This will perform this on the listed workspace from above.""" Go into ArcMap, make a selection (or def query) if you don't want all of your data exported. Right click in the TOC, export data -> Choose a directory and NOT a gdb and your file will automatically be created as a shapefile. Feature classes are simply features that reside in a gdb. Their non-gdb counterparts are automatically shapefiles. You can do this from ArcCatalog by exporting the feature class to a non-gdb directory too I believe. Not the answer you're looking for? 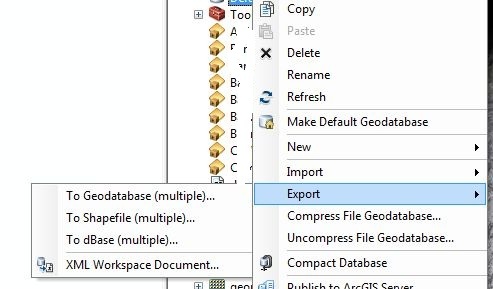 Browse other questions tagged arcgis-desktop arcgis-10.0 export spatial-database features or ask your own question. How to export multiple class training data from ArcGis into R? Providing multiple shapefiles belonging together in single file with predefined symbology in ArcGIS Desktop?